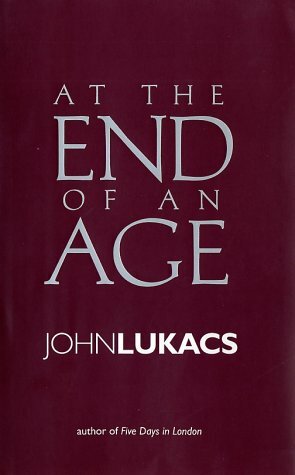 John Lukacs is a prolific historian, with an acute interest in topics like the end of modernity and the influence of populism. Since I am in the midst of Gregory Cochran and Henry Harpending's 10,000 Year Explosion, I find the contrast illustrative. Cochran and Harpending talk of the importance of biology in understanding history, while Lukacs focuses on the primacy of ideas. Taken together, you've got something really interesting. John Lukacs is the Isaac Asimov of historiography, at least in terms of productivity. Since leaving communist Hungary for the United States soon after the Second World War, he has published dozens of works for various audiences, narrative history as well as historiography. His chief subject has been the Second World War; perhaps his best-known books are the “The Hitler of History” and “Five Days in London, May 1940.” Amidst all this industry, he has sometimes touched on the matter of the end of the “Modern Age.” Indeed, he might seem to have done more than touch on the subject, since two of his book titles are “The Passing of the Modern Age” and “The End of the Twentieth Century and the End of the Modern Age.” Nonetheless, believing that he has not yet done the End justice, in this book he explains more fully just what he believes is ending. In many ways, though, the most interesting parts of the book are a detailed treatment of his ideas about historiography. The notion of “the Modern Age” is a matter of intellectual history, though that is far from saying that modernity is something that exists only in books. In the Renaissance and afterwards, the thinking West entered a new stage of historical consciousness. A consensus arose that the present was different from the prior era, which became “the Middle Ages.” In many ways, the new consciousness looked beyond its immediate predecessor, back to Classical antiquity. Indeed, the novelty was even greater. The West developed historical consciousness per se. People began to believe that every fact and every person could be understood only in a historical context. The development of historical consciousness and of the scientific method have been the defining features of modernity. Both of these still have a future, but not, as we will see, quite in the form that modernity knew them. The Modern Age was the time of the bourgeois, a special kind of person who should not be confused with the statistical concept of the “middle class.” The bourgeois world is only incidentally democratic; the growth of early modern absolute monarchies was also a bourgeois phenomenon, since the power of the monarch served to eclipse the influence of the aristocracy. The bourgeoisie was chiefly distinguished by its personal habits. It cultivated privacy, but not for the sake of individualism. The bourgeois invented the family, indeed the bourgeoisie invented childhood. The bourgeois habit of keeping children at home rather than sending them out to work is historically eccentric. A mark of the end of modernity is the trend toward again treating children as little adults. All things considered, there has been a deplorable decline in solid, bourgeois hypocrisy. People at least used to know which virtues they were supposed to pretend to have. At the end of the Modern Age, in contrast, the descendants of respectable Victorians are open and honest and as interesting as wet noodles. Another mark of the end is the decline of reading, except presumably as a purely utilitarian skill. The Modern Age was preeminently the age of the book. As modernity developed, its characteristic art form became the novel, a type of literature that cannot be understood apart from the growth of historical consciousness that preceded it. Novels are still being written, of course, and despite the widespread critical laments about “the death of the novel,” it is still too soon to say that the form itself will diminish into mere genre. Be that as it may, the important point is that the popular mind, even the educated popular mind, is once again being informed primarily through images and spectacles, as it was in the Middle Ages. As a successful writer of popular history, Lukacs is no doubt prejudiced on this subject, but he may be on to something when he suggests that popular history may be replacing the novel for serious readers. According to him, sales of history for a general readership have long been greater than those of novelists. In history, he includes biography, which he says has overcome the stigma of mere literature from which it once suffered among historians. I might note that H.G. Wells predicted in “The Shape of Things to Come” that historical biography would replace the novel as the preferred literature of the 21st century. This is surely one of the few points on which Wells and Lukacs are in agreement. Though the novel may suffer eclipse, Lukacs says that the historical sense will continue. Indeed, one of the odd things about the 20th century was that the “hunger for history” grew at the same time that the amount of history known by ordinary educated people declined. Lukacs even makes bold to predict that, in the 21st century, a new kind of literature could appear, a new kind of history that could satisfy the desire for breadth of understanding once afforded by the novel. Though he does not bring the matter up, I am pretty sure he was not thinking of Alternative History. Still, as will see, his ideas about historiography do have significance for that new popular form. As for science, it is simply another part of intellectual history for Lukacs. This is not to say that the discoveries made by scientists are just another kind of contemporary art. However, the attraction that some problems have for scientists at a given time is likely to be influenced by the general cultural atmosphere, as is the sort of answer that seems plausible to them. Thus, quantum mechanics was a characteristic feature of the German-speaking world of the Weimar Era. In some sense, it was even a “right-wing” theory, in contrast to the deterministic, “Marxist” cast of relativity. Be this as it may, it is true that these somewhat conflicting theories appeared early in the century and stayed put. They have yet to be replaced or reconciled. Lukacs is not at his best when discussing science. He makes excessive use of the metaphysical implications of quantum mechanics, arguing that the principle of indeterminacy renders the idea of scientific objectivity untenable. He has a Kantian conviction that cosmology is as foolish as astrology; he has little patience with the prospect of a “Theory of Everything.” This distaste extends to technology, or perhaps arises from it. He is little pleased with genetic engineering. He is, however, encouraged by the advent of the Green environmental movements, though he regrets that they do not yet see that they are really on the side of the moral traditionalists. (Lukacs's least favorite form of life seems to be American free-market conservatives.) He foresees the end, not of historical consciousness, but of the belief in progress that informed that consciousness during high modernity. What Lukacs is trying to do is link a philosophy of science with a historiographical method. The idea is to eschew theory in favor of an intimate knowledge of both the material and spiritual circumstances of historical actors. He quotes Goethe as laying down a rule for both science and life: “Do not go looking for theory behind the phenomena…everything factual is already is own theory.” Whatever its drawbacks for physical science, this is sound advice for historians. There is a sense, Lukacs says, in which a Zambian historian might be more objective about Hitler than would a German or a Jew. The Zambian, however, would be unlikely to understand Hitler as well. Context is the key. Objectively speaking, Stalin may have caused more misery than Hitler did, but the Nazi regime might still be considered the more evil. There were precedents for Stalin in Russia; there was no German precedent for Hitler. Determinism in every form is false, including spiritual determinism. Economic or technological forces do not make history. Neither is it made by culture. R. G. Collingwood was, in his way, quite as wrong as Marx. Collingwood believed that, if you reconstructed the ideas of an era carefully enough, you would see that it was inevitable that the people of that time behaved as they did. Lukacs will have none of it. For him, you can reconstruct the potentialities that an era afforded, but you cannot show that it was inevitable that one possible course of action would be chosen. This all seems sound enough. However, it is in the service of a more questionable principle: mind and matter are one, but mind predominates. Again using Hitler as an example, Lukacs argues that the economic success of the Nazi regime did not come from the adoption of wise policies. Hitler had scarcely any ideas about economics at all. Rather, the German economy revived on a wave of national enthusiasm. He even quotes Simone Weil to the effect that there are no laws of economics, but just the exercise of free will by economic actors. This is surely one of those occasions when Ayn Rand was more right than was Simone Weil. The 20th century was full of examples of countries that were ruined by regimes that confused economic policy with whipping up enthusiasm. That was precisely the view behind the Great Leap Forward In China at the end of the 1950s. The people who implemented it even seem to have believed that the laws of nature were psychically malleable, rather as Lukacs proposes. The result was the largest famine in a century notable for large famines. Lukacs's metaphysics is aimed at “saving the appearances,” to use the title of two books by different authors who argued for this kind of idealism. There is nothing wrong with the anti-reductionist impulse behind this position. Rainbows are as real as anything else, for instance. They are, if anything, more real than the laws of optics that might foolishly be invoked to argue that rainbows are optical illusions. Similarly, the sun really does rise in the east and set in the west. Other observations would obtain if you viewed the sun from space, but both sets of observations are true in their own contexts. Lukacs's purpose in adopting this principle is not just metaphysical, but theological. He uses the principle of deference to experience to argue that Earth is the center of the universe and that the Incarnation is the center of history. The term anthropic cosmological principle does not occur in this book, perhaps because it is an example of the dubious science of cosmology. Nonetheless, it is the kind of thing he is talking about. Lukacs's interpretation of the idea, however, has an apocalyptic element that implies a short future, rather like the Carter-Leslie Doom Soon Hypothesis. (If I understand Lukacs correctly, he suggests that humanity may be no older than history.) It is not evolution or creation that is the question, he says, but evolution or history. A short past makes a short future more plausible. Indeed, it suggests that the terminal era we are experiencing may be the end of more than merely the Modern Age of the West. Some of these ideas are better than others. There is much to be said for the expectation that doomsday will always be with us. Still, it is some evidence for the hypothesis of the end of an era that Copernicus is being challenged from such different perspectives. All modern philosophy is a footnote to Kant [or perhaps to Descartes], as all philosophy is a footnote to Plato. Kant is deservedly considered a great philosopher. Charles Murray puts him at number 3 in the list of the 100 most eminent philosophers. However, Kant is unusual among philosophers in having a major element of his philosophy refuted by later experimentation. Sure, sure, I hear you reciting examples of things Aristotle got wrong, like gravity. Nothing important in Aristotle's physics has been refuted. If anything, it is experiencing a resurgence. Kant's natural philosophy is radically at odds with quantum mechanics and general relativity alike. However, the real thrust of Kant's philosophy was ethics, and this is were Kant retains enormous influence. Kant's solution to the question of the origin of moral obligation was wonderfully ingenious, though historically catastrophic. In effect, his guiding question is not, "What would Jesus do?" but "What would I do if I were God?" The modern turn in Kant's philosophy was to make the will the font of morality. Much later mischief has come of this. All modern philosophy is a footnote to this book by Immanuel Kant (1724-1804), professor of the University of Königsberg and, by some accounts, the most boring man who ever lived. If we hold up the "Critique" to a light, we can see all kinds of creatures in embryo: Hegel's historicism, Marx's dialectical materialism, Nietzsche's Triumph of the Will, as well as such later hatchlings as Pragmatism, Logical Positivism, and Mathematical Intuitionism. There is even, perhaps, a hint of the feral supernatural that we see in the fiction of H.P. Lovecraft, which is a very late product of New England Transcendentalism. Kant's Transcendental Idealism is one of the great philosophies, fruitful even when it is wrong. Such systems are never simply refuted. Nonetheless, looking at the Critique from the beginning of the 21st century, it is clear that Kant was too pessimistic about the possible scope of human knowledge. It is also clear that, oddly enough, he had nothing to say about the real limits of pure reason.